Our plugs expand and impregnate bearing surfaces with a hard, mirror-like film. Turning or sliding during machine operation spreads the lubrication to greatly reduce friction and wear. Our bearings are self lubricating and never require oil or grease. For normal duty, they are manufactured from a variety of bronze alloys; including tin, leaded, manganese, and aluminum bronze alloys. However, they can be made from almost any metal when the application demands it. These bushingare made in either a solid, 1 piece, or 2 piece bearing. The graphite is installed through the bearing wall. 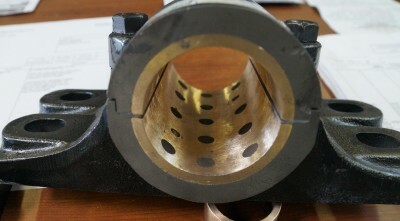 For best results, they bearings should be press fit into the housing and force the lubrication to the shaft. 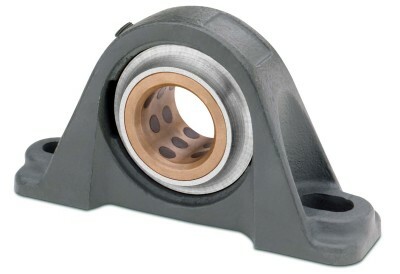 The 200 series products come in cast iron housings with self lubricated bearings. They can be standard Pillow Block housings of also come in 2 bolt, and 4 bolt flange housings. 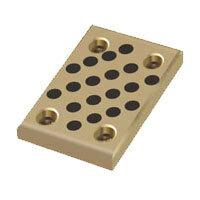 Wear plates are sold in a variety of alloys, chamfers, mounting holes, or shapes. Thrust washers are often use in plate of a flanged bearing. They are usually made from a casting and rough machined to your dimensions. Then the graphite plugs are installed and the part is finished machined on one or both surfaces.